Chiyono Hasegawa (1896–2011), a resident of Saga, was one of hundreds of Japanese women to have lived past 110 years. She is pictured here in September 2010. She was the oldest person in Japan and second oldest in the world, dying at 115 years, 12 days. Japanese supercentenarians are citizens, residents or emigrants from Japan who have attained or surpassed 110 years of age. As of January 2015[update], the Gerontology Research Group (GRG) had validated the longevity claims of 264 Japanese supercentenarians, most of them women. The oldest Japanese person on record was Nabi Tajima, who died on 21 April 2018 aged 117 years, 260 days. Japan was also home to the world's oldest man ever, Jiroemon Kimura, who lived to age 116 years, 54 days. Since Chiyo Miyako's death on 22 July 2018, the oldest living person in Japan as well as the world is Kane Tanaka, born 2 January 1903, age 116 years, 106 days. Since Masazō Nonaka's death on 20 January 2019, the oldest living man in Japan is Chitetsu Watanabe, born 5 March 1907, age 112 years, 44 days. Denzo Ishizaki (石崎 伝蔵, Ishizaki Denzō, 20 October 1886 – 29 April 1999) was for a short time Japan's oldest living person and the world's oldest living man, from February to April 1999, and when he died the oldest Japanese man ever until being surpassed by Yukichi Chuganji on 30 September 2001. A former elementary school teacher and town assembly member, Ishizaki lived in Kansago, Ibaraki Prefecture, where he died of multiple organ failure on 29 April 1999 at the age of 112 years, 191 days. 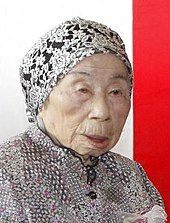 Mitoyo Kawate (川手 ミトヨ, Kawate Mitoyo, 15 May 1889 – 13 November 2003) became the world's oldest living woman after the death of Mae Harrington on 29 December 2002, and the world's oldest living person after the death of Japanese man Yukichi Chuganji on 28 September 2003. On 31 October 2003, after Kamato Hongo's death, Kawate was recognized as the oldest living person in the world, though in fact, Kawate became the oldest living person in the world on 28 September 2003, because Kamato Hongo's record was revoked in 2012. A resident of Hiroshima, she worked on a farm until injuring her hands at the age of 99. In 1945, two days after the atomic bombing of Hiroshima, she entered Hiroshima city in order to look for acquaintances. She was taken to a hospital shortly before her death aged 114 years, 182 days from pneumonia. Her death left Ramona Trinidad Iglesias-Jordan of Puerto Rico the oldest documented person in the world, though this was not recognized by Guinness World Records until 2004 (Charlotte Benkner of the U.S. had been given the title in the interim). Masazō Nonaka (野中 正造, Nonaka Masazō, 25 July 1905 – 20 January 2019) was, at the time of his death, Japan's oldest living man since Masamitsu Yoshida's death on 29 October 2016, the world's oldest living man since Spaniard Francisco Núñez Olivera's death on 30 January 2018[a] and the oldest living person in Hokkaido Prefecture since Teru Hakateyama's death on 3 April 2016. Nonaka was also the oldest person ever born in Hokkaido Prefecture as well as Hokkaido's second oldest person ever behind Hatsue Ono (however, she was not born in Hokkaido) and the 4th oldest Japanese man ever behind Jiroemon Kimura, Yukichi Chuganji and Tomoji Tanabe. Nonaka had two brothers and three sisters and married Hatsuno Nonaka in 1931. They had five children (of whom three were living as of January 2019). He ran the family onsen (hot spring), which opened in 1905, and spent most of his time in a wheelchair, crediting his longevity to eating sweets and relaxing in the hot springs. Nonaka died of natural causes at 1:30am on 20 January 2019 aged 113 years, 179 days at his home on the island of Hokkaido and was succeeded as the oldest living man by German Gustav Gerneth and as Japan's oldest living man by Chitetsu Watanabe. Nabi Tajima (田島 ナビ, Tajima Nabi, 4 August 1900 – 21 April 2018) followed Violet Brown as the world's oldest person for 217 days after 16 September 2017. She was the last surviving person from the 19th century. With 117 years and 260 days, she remains the second or third oldest person ever and the oldest Asian to be validated by modern standards. Tajima was born and died on the small island of Kikaijima, about halfway between Okinawa and the main Japanese islands. Her husband, Tominishi Tajima (田島 富二子), died at the age of 95 in the early 1990s. She had nine children, seven sons and two daughters, and in September 2017 she was reported to have around 160 descendants, including great-great-great-grandchildren. She stated that her longevity was due to sleeping soundly and eating delicious food. Guinness World Records was planning to certify Tajima as the world’s oldest person, but she died at a nursing home in Kikai City before they could do so. ^ Francisco Núñez Olivera died 29 January 2018 around 10:30pm CET However, in Japan, the date was already 30 January 2018 (JST). ^ a b c d e f g h i j Wikkerink, Marco; Kroczek, Waclaw Jan (1 January 2015). "GRG Database by Nation". Gerontology Research Group. Retrieved 8 November 2018. ^ いつまでも「輝く宝」で　木村次郎右衛門さん告別式 [Jiroemon Kimura's funeral – a sparkling jewel forever]. Kyoto Shimbun (in Japanese). 14 June 2013. Archived from the original on 15 June 2013. Retrieved 20 October 2013. ^ a b c d e f g h i j k l m n o p q r s t u v w x y z aa ab ac ad ae Epstein, Louis; Young, Robert; Adams, Johnny; Muir, Mark (7 December 2018). "GRG World Supercentenarian Rankings List – Validated Deceased Supercentenarians". Gerontology Research Group. Retrieved 9 December 2018. ^ a b c d e f g h i j k l m n o p q r s t u "Verified supercentenarian cases – Japan". GRG. 10 April 2007. Retrieved 17 December 2018. ^ a b c d e f g h i j k l m n Epstein, Louis; Young, Robert; Adams, Johnny; Muir, Mark (7 March 2019). "GRG World Supercentenarian Rankings List – Validated Living Supercentenarians". Gerontology Research Group. Retrieved 7 March 2019. ^ "World's oldest woman dies at 115 in Japan". Fox News. Associated Press. 13 January 2013. Retrieved 19 November 2018. ^ a b c d e f "Deaths for 2011 (in Chronological Order)". GRG. 17 November 2014. Retrieved 9 December 2018. ^ a b c "Deaths for 2010 (in Chronological Order)". GRG. 18 September 2014. Retrieved 9 December 2018. ^ a b "Deaths for 2007 (in Chronological Order)". GRG. 24 September 2014. Retrieved 9 December 2018. ^ a b c d e f g h "Deaths for 2012 (in Chronological Order)". GRG. 4 November 2014. Retrieved 9 December 2018. ^ a b c d "Deaths for 2009 (in Chronological Order)". GRG. 3 December 2014. Retrieved 9 December 2018. ^ a b "Deaths for 2008 (in Chronological Order)". GRG. 1 July 2013. Archived from the original on 5 July 2015. Retrieved 9 December 2018. ^ １１３歳、大城テルさん死去　沖縄県内最高齢 [Mrs. Teru Ohiro died at 113, the oldest person in Okinawa Prefecture]. Ryūkyū Shimpō (in Japanese). 29 January 2018. Retrieved 19 November 2018. ^ "Deaths Elsewhere - Denzo Ishizaki". The Baltimore Sun. 2 May 1999. Retrieved 14 September 2015. ^ "DENZO ISHIZAKI". Orlando Sentinel. 30 April 1999. Retrieved 14 September 2015. ^ a b c "World's oldest person dies at age 114". CNN.com. Archived from the original on 5 September 2008. ^ a b "Table C - World's Oldest Person (WOP) Titleholders Since 1955". grg.org. Retrieved 2015-11-26. ^ "Mitoyo Kawate, 114; Listed as Oldest Person in the World". latimes.com. ^ "国内最高齢１１２歳の男性死去　東京の吉田正光さん". 産経ニュース (in Japanese). 産経新聞. December 15, 2016. Retrieved April 12, 2018. ^ "World's oldest man revealed as 112-year-old Masazo Nonaka". news.sky.com. Retrieved April 11, 2018. ^ "The Key to Longevity for the World's Oldest Man Alive? Sumo Wrestling and Hot Springs". Time. Associated Press. 11 April 2018. Archived from the original on 14 April 2018. Retrieved 10 November 2018. ^ "World's Oldest Man, Who Loved Sweets and Lived at a Hot Springs Inn, Dies in Japan at 113". PEOPLE.com. Retrieved 2019-01-30. ^ Schumann, Rebecka (9 June 2014). "Misao Okawa, The World's Oldest Woman, And 39 Other Female Supercentenarians". International Business Times. Retrieved 7 July 2015. ^ "Worlds oldest age 117-year-old Tashima Navi died". ^ Guinness World Records 2015. Guinness World Records. 11 September 2014. p. 77. ISBN 978-1-9088-4370-8. ^ a b Daniel Politi, The Last Known Person Born in the 19th Century Dies in Japan at 117, Slate Magazine, 22 April 2018. ^ "Japanese woman becomes 3rd oldest person in history". BNO News. 9 April 2018. Retrieved 10 April 2018. ^ a b "「ナビばあちゃんちばりよー」／喜界町の田島さんに県祝い状" ["Grandma Nabi" - Kikai City holds provincial celebration for Mrs. Tajima] (in Japanese). 16 September 2015. Retrieved 25 November 2015. ^ Horton, Alex (22 April 2018). "The world's oldest person died at 117. She was the last known person born in the 19th century". The Washington Post. Retrieved 8 November 2018.